“My first memory that I know to be my own was at the airport,” Donna tells me. “We went to meet my grandmother at the Atlanta airport. I was two and she was 72.” Donna and I met for lunch the week before, but there were still more stories to tell so we find ourselves in my living room sipping tea. 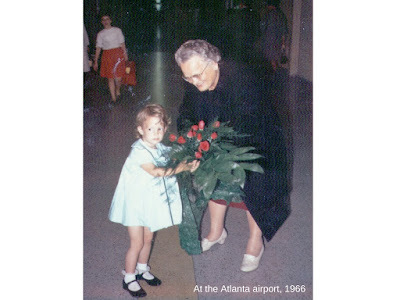 The memory is significant, because now, exactly 50 years later, Donna works as the Episcopal clergy at the Atlanta airport. Referred to as the Vicar of ATL by many, she is part of an international interfaith ministry dedicated to helping travelers in need. My first memory of Donna was at a gathering of new faculty at Sewanee: The University of the South where we made small talk while balancing plates of hors d'oeuvres. My daughter was turning two and my marriage was a mess. I took a year-long fellowship as the Tennessee Williams Playwright-in-Residence, which I hoped would give me time to figure out what I was doing with my life. There were events for the new faculty, meant to build community. When you live on top of a mountain in Tennessee community is particularly important. Every Tuesday for a year we met for lunch. Donna had recently completed her PhD at Emory and was waiting her ordination as an Episcopal priest. She came to Sewanee as a sabbatical replacement in the religion department, leaving her family behind in Atlanta; I was feeling isolated and in need of adult conversation. Our weekly meals became something to look forward to. 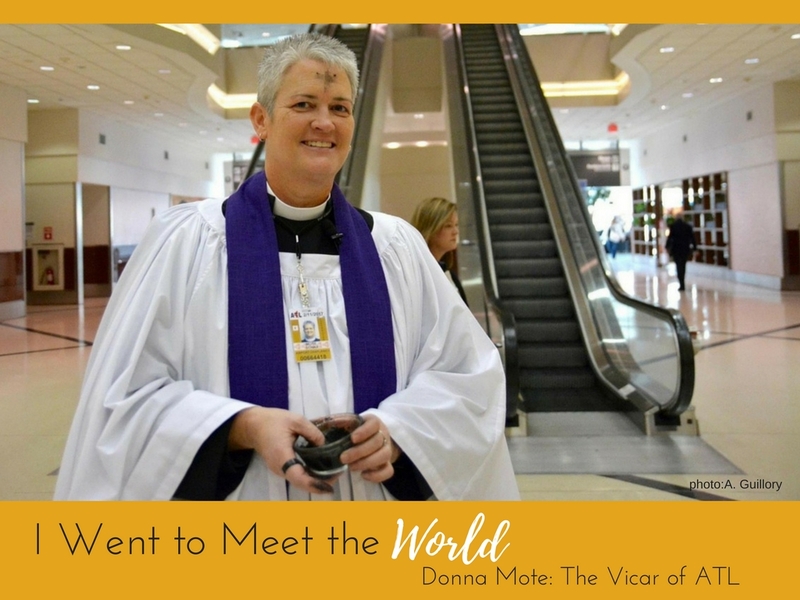 The following year, Donna returned to Atlanta where she was assigned to the interfaith ministry at the Atlanta airport, in addition to taking on duties with a local parish. But once a week she returned to Sewanee to teach a class at the School of Theology. In need of a place to stay each week, we opened our house to her. Donna spent every Thursday night at our house for almost two years. It was a mutually beneficial arrangement. We would often sit up talking at night. She provided me with a sounding board, or as I liked to call it, “personalized pastoral care.” In those dark days at the end of my marriage, just having someone to share my day with often felt like a lifeline. It also served as an opportunity to show my daughter that it is important to open your home to others. Raised Southern Baptist, Donna first felt a calling to the church in high school. She was particularly drawn to international ministry, which would allow her to travel. While in college she spent summers abroad in Israel and Liberia. But when there was a fundamentalist takeover of the Seminary she was attending, they eliminated the missionary positions that many women filled, leaving her unsure of what to do. She took a break from the church and worked a day job before being called to be the Pastor at a church in Louisville. After two years, she decided to go abroad. She wanted to live in a place where Christianity wasn’t the dominant religion, so she moved to Japan to teach English. Immersing herself in Japanese culture, she studied Japanese tea ceremony and Kendo sword fighting. After 5 years she returned home to help care for her ailing father. With her experience in Japan as inspiration, she enrolled in Emory to complete her Ph.D. After attending the ordination of a friend, she felt a connection to the Episcopal church. Their inclusive practices felt welcoming. In 2008 she became an Episcopalian. In 2010 she was nominated to become a priest and in 2012 became a postulate. She continues to teach at the School of Theology, but now she makes the round trip drive in one day. Her work at the airport continues to grow. On Ash Wednesday she wanders the terminals offering ashes to those who are observant. Donna is often called to support to passengers in crisis, like those traveling home for the funeral of a loved one. She greets active duty service members arriving home and even escorts the bodies of fallen soldiers. Some of her most important work, however, involves the service workers in the airport, many of whom go from one minimum wage job to another, practically living in the airport. Donna’s service work extends beyond her work at the airport. She holds vigil with other clergy each time there is a death row execution in Georgia and is an advocate for women’s and LGBTQ rights. I admire her dedication to her faith and the causes that she feels promote acceptance and compassion as dictated by the Bible. But there is still more work to be done. There are the immigrant families to greet, students to mentor, and what seems like a steady stream of inmates waiting to meet their fate. But Donna walks the walk. Want to know more about the 40 Lunches Project? Click here. You can also follow along by LIKING it on Facebook. Feel free to share! I've never heard of such a role. It sounds fascinating! All the people you can meet from all around the world, all without leaving your "office!" Think about all the times you walked past the airport chapel! It's such an interesting ministry. Thanks for taking the time to read. She's a rock star! Thanks for taking the time to read.